With the new year already here, I’ve been brainstorming ways to get organized. 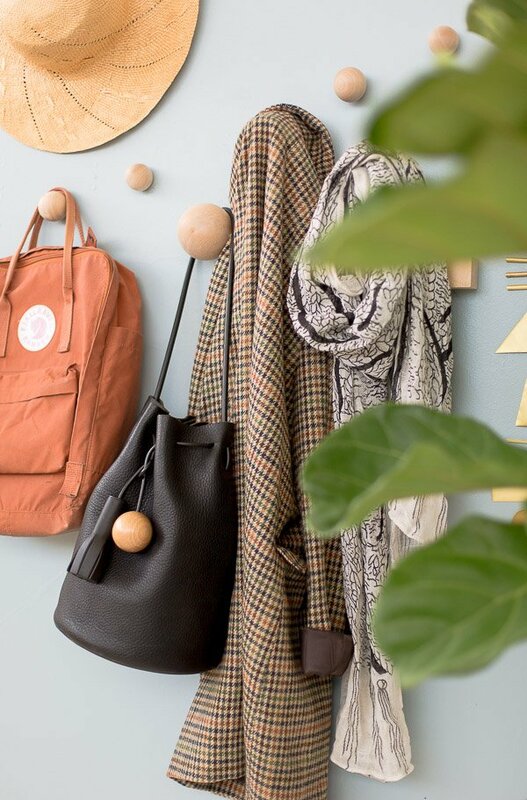 And after a quick trip to the craft store, I came up with a wall hooks idea to give my jackets, bags, scarves, etc a much-needed place to hang on the wall. 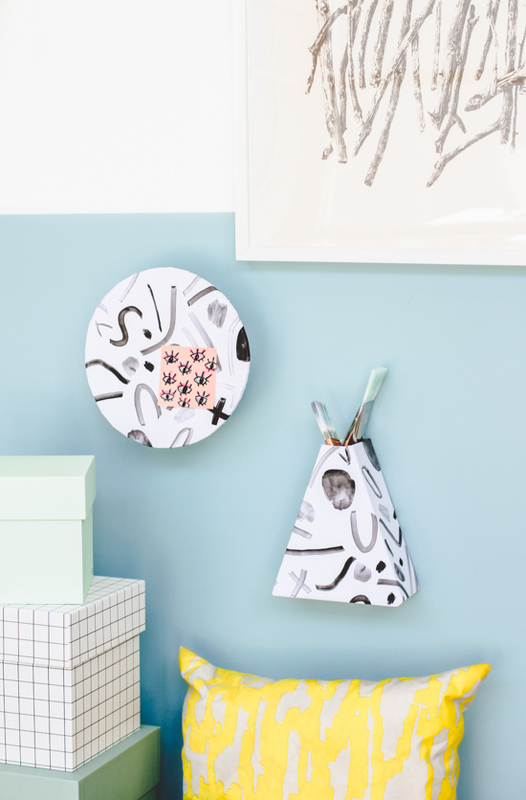 When these DIY wall hooks are not in use, they just look like cool geometric shapes, blending in with any decor as a wall art installation. But when you need ’em, they’re there – functioning as any other wall hook would. And they’re so easy to make with just a few supplies too! Click through for the tutorial. If using a large dowel rod for any wall hooks, start by placing rod into clamp vise and cutting 3-5 inch pieces of dowel rod with a saw or jigsaw. Then, sand edges if needed. Next, keeping the block in the clamp vise, drill a pilot hole in the center of each block (don’t go all the way through). Insert one end of the double ended screw into the hole and use a pair of pliers to screw in and secure. Stop at the halfway point. If you want to keep the wood raw they’re ready to hang (screw into the wall), but if you want to add some color, you can paint them with acrylic paint. I went with two-toned painted dowels, at first. 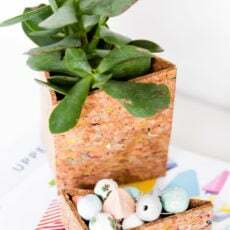 But when hanging everything, I decided I liked the raw wood blocks best. So I used mainly the unpainted blocks in the entryway, in the end. Which is why I didn’t show the painting portion of the hooks in the steps. 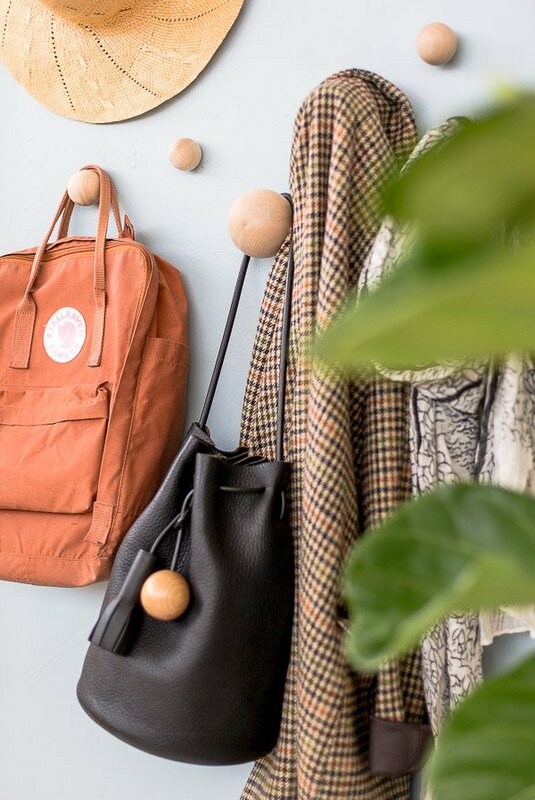 I think the wooden circle hooks are my favorite. They look like little bubbles on the wall. 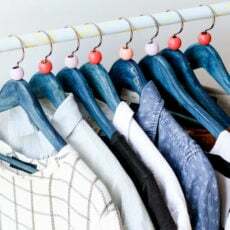 UPDATE: If you’re planning to hang heavy items from these hooks, be sure to first add a wall anchor (like these from Amazon) before screwing the hook into the wall. Are you getting organized in the new year?! 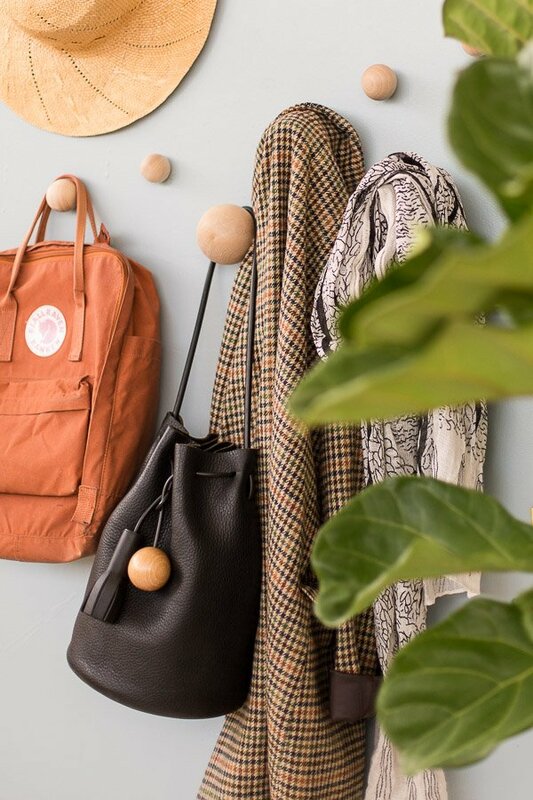 Could your entryway use a revamp with these DIY wall hooks? I am a big fan of using the wall to get organized. For many, this is the last “unused” space they have. Always good to use a wall anchor if you might hang something heavy on it. I think the raw wood looks terrific! That’s a great point to use a wall anchor if you plan to hang heavy items from the hooks. I’ll update the post with that info, Seana. Thanks! What a cool DIY to start the year, love the natural look of them! The entryway looks awesome. I love it. 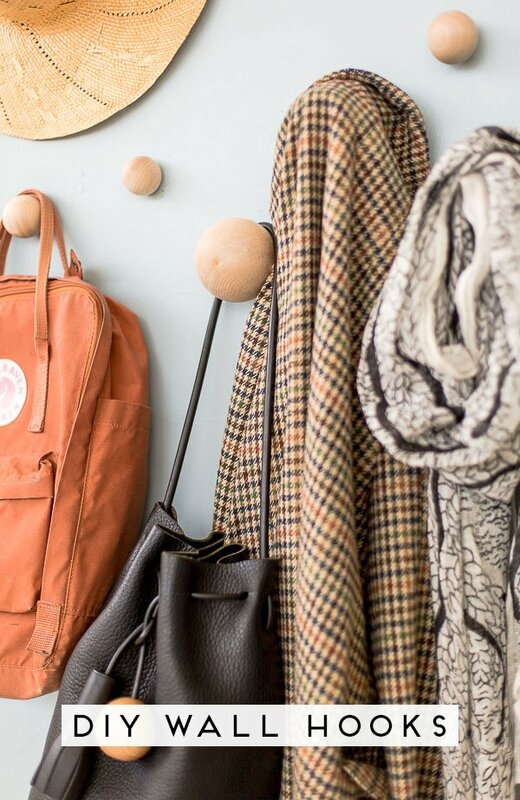 My entryway could definitely use a revamp with these DIY wall hooks! 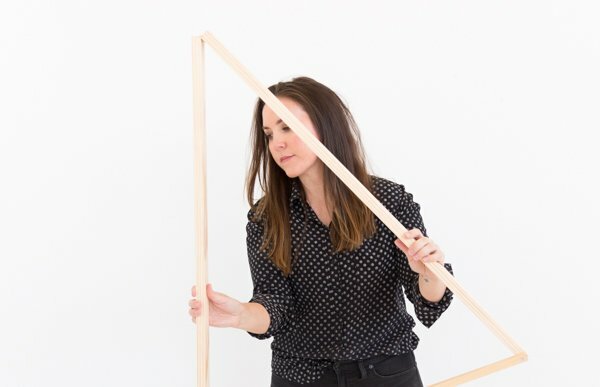 I love that they make a great statement piece but are also super functional as well. Thanks for sharing! Aw, thanks Helen. If you get this one try, let me know. I think you’ll find it to be super easy! Those are gorgeous! I love that idea! Thanks so much Pink Pineapple and Coco. Much appreciated. I loved the diy! I really want to try it! could you share the measures of the double dowell screw you used? I’m from Brasil and our measurement system is in centimeters… and I always buy the wrong size of things even trying to convert. I adore these but I can’t seem to figure out how I’d get them around like this. The link to the blocks does not have round ones like this. Can you share the source for your adorable leather bag? Hi Brittni! I’m always looking for ways to increase my vertical storage options, it makes such a difference in getting things off the floor. Such a fan of your aesthetic too! I recently started selling concrete wall hooks (linked if you’d like to see), but I love the wood version so much too!